3rd T20I: It is no secret that apex cricket body ICC is a big fan of former India skipper MS Dhoni, but a moment during the ongoing 3rd T20I at Hamilton saw random tweeting on the official Twitter handle. 3rd T20I: It is no secret that apex cricket body ICC is a big fan of former India skipper MS Dhoni, but a moment during the ongoing 3rd T20I at Hamilton saw random tweeting on the official Twitter handle. 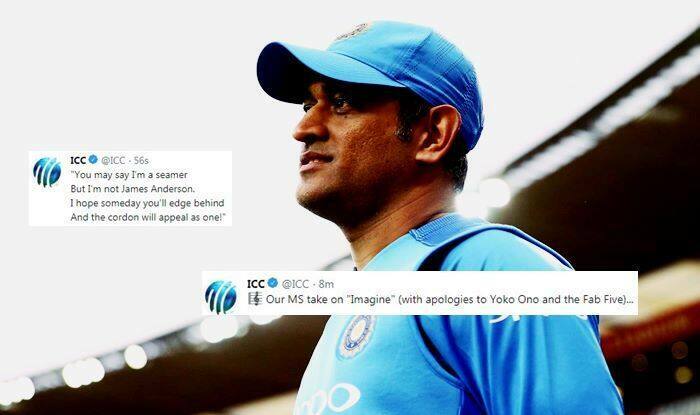 The tweets were on Dhoni and that made some fans feel if the account was hacked by a Dhoni or a CSK fan. ICC made 13 tweet posts in seven minutes, out of which only a couple mentioned Dhoni and the rest sounded vague and confused fans. The first post read, “Our MS take on “Imagine” (with apologies to Yoko Ono and the Fab Five)…” But it was not an embeddable tweet. It was quite surprising and fans reacted hilariously to the posts.